At Techture, we work to integrate additional dimensions of costs and time with the 3D models, hence enabling end clients to visualize projects in an unparalleled fashion. Multiple activities happening simultaneously can be viewed and planned for most effective resource utilization. Time and costs can be remotely monitored and acted upon. The 4D and 5D Simulations provided by Techture act as dashboards to manage entire projects. These can be further integrated with legacy technologies like ERPs to manage procurement and other tasks in an efficient manner. The simulations can be linked to macro as well as micro schedules. The former can be used for site-wide activities planning while the latter can be utilized to showcase specific construction procedures to the site teams. Simulating the progress of the construction activity helps the construction team visualize logistical issues or inefficiencies. The virtual simulation exposes details such as out-of-sequence work, scheduling conflicts between multiple trades, ‘what if’ scenarios, and macro-level construction phasing strategies – all in order to achieve the optimization of the construction schedule. Coupled with visual insight, we also provide a complete step-by-step report representing the planned construction set against time and cost using the 4D and 5D BIM simulations. The requirements, nowadays, for more effective planning and management assistance from BIM tools have become even more demanding. Fulfilling this demand since we started our practice through BIM has given us an expertise in the field of Construction Planning and Management. 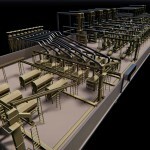 The process of CPM through BIM has significantly more advantages over the conventional Planning and Management sheets. The visuals provide an accurate insight on the kind of progress the site might experience with the given construction schedule. These visuals also help us analyse the ‘what-if’ scenarios and enables us to counter these situations in a dynamic manner. The construction schedule developed in native software like PrimaVera and MS Project can be linked to the BIM model and analysed further on aspects like feasibility, constructability, methodical procedures and sustainability. This linking can further be assigned the particular resources required to complete a defined task. This resource allocation will give rise to another dimension of cost which can be integrated further. The cost integration results into the further dimension which shall be called 5D and the simulations of the same enables the Construction Managers to examine the construction execution plan with respect to time and corresponding costs. The BIM Model provides an insight of the design in 3D and its linking with the Construction Schedule can provide a detailed visual description of the stage of the project at different stages. As the construction projects are present in areas with dense population and structures all around , the planning of logistics i.e. construction material as well as machinery becomes an important aspect during the planning stage. Logistics plan has to be modified progressively and depends on the stage of construction and the available areas and access routes at that point of time. As BIM has been envisaged as one of the important tools of planning, Techture ensures to use the BIM Model to aid and collaborate with the site team to generate site logistics simulation at each stage of the project progressively as per the conditions on the site changes & keep the flow of construction smooth . Characterised by the short turn around time. Construction Schedule can made by us. Detailed Simulation: Consists of MEP components and color codes. Logistic simulation: Planning of placement and movement of construction machinery around the site. Resource Loading: Feeding the BIM model with the appropriate resources to get the cost factor in the simulations. Cost: Enables cost verification between the BOQ provided by the client and the internal costs extracted through the BIM model. 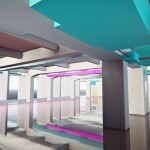 “BIM is not just 3D. The inclusion of dimensions of time and cost take the project to the next level giving rise to a coordinated 5D model.” Simulating the progress of the construction activity helps the construction team visualize logistical issues or inefficiencies.